45 degree quick acting coupler. Camlock Female Coupler by Male Adapter. 90 degree quick acting coupler. 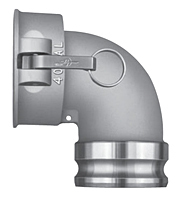 Camlock Female Coupler by Male Adapter.